Observation - cramp balls - UK and Ireland. 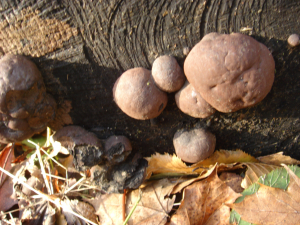 Description: brown, round globs on what looked like a rotting log of beechwood. They measured from 5-9cm in width. brown, round globs on what looked like a rotting log of beechwood. They measured from 5-9cm in width.